Although five years have passed since the nuclear disaster in Fukushima, there is still no end in sight to the problems and radiation-tainted water continues to flow into the sea. Despite this, the government is brazenly attempting to restart reactors around the country and accelerating the export of nuclear technology overseas as if a nuclear accident had never occurred. Nonetheless, the government, Nuclear Regulation Authority, power companies and local municipalities with nuclear facilities chose to ignore the voice of nearby municipalities, local citizens and civic society and restarted the No.1 reactor of Kyushu Electric’s Sendai nuclear power plant in August and its No. 2 reactor in October last year without even devising an adequate evacuation plan. Shikoku Electric’s Ikata nuclear power plant No. 3 reactor and Kansai Electric’s Takahama nuclear power plant No. 3 and 4 reactors are also on course for restart after gaining the approval of local mayors. The question remains as to who will take responsibility in case of disaster and how they will go about this. We, the people of Japan, will not tolerate the restart of any nuclear facilities under any circumstances. In addition, over 100,000 people are still living as evacuees following the Fukushima nuclear disaster and cannot return to their hometowns. Fukushima Prefecture’s policy indicates that it will cut housing support for 30,000 of these people, known as voluntary evacuees, in March 2017, and stop compensation to areas of forced evacuation in March 2018. Evacuees are therefore faced with the stark choice of either being exposed to radiation or falling into poverty. The authorities are ignoring the high radiation levels and the impact on people’s health, including the possibility of thyroid cancer, in trying to force people to return home and start rebuilding their lives without providing them due respect. We will not accept this. We will not tolerate this. Five years have passed since the Fukushima nuclear disaster and the victims are doing their best to move forward and reconnect with each other in spite of the irrational actions of the government. It is essential that we connect with the victims and build and expand a strong network of support. We must learn from the suffering caused by the nuclear disaster by not tolerating the restart of any nuclear facilities. People from all Japan, we urge you to gather in Yoyogi Park on March 26 to help us realize a nuclear-free society and demand relief and compensation for the victims of the nuclear disaster, who are seemingly being cast aside. Humankind and nuclear power are not meant to coexist. Let’s move toward a society that values all human life rather than one based solely on economics. It’s time for each of us to connect our ideas and our knowledge, and act. Let’s use our voices and take the next step forward to a better, safer world. NO NUKES DAY has been designated as a day for united action aiming for a nuclear free future and is a united initiative of Sayonara Genpatsu 10 Million People’s Action, and Genpatsu wo Nakusu Zenkoku Renrakukai and Metropolitan Coalition Against Nukes. Previous NO NUKES DAYs have been held on June 2, 2013, October 13, 2013, March 9, 2014, June 28, 2014 and March 8, 2015. 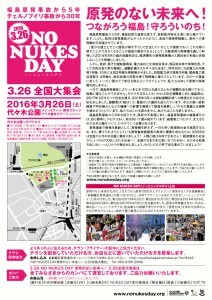 The sixth NO NUKES DAY planned for March 26, 2016 is expected to be the biggest demo yet. Let’s unite as a country and put further pressure on the government and power industry to put an end to nuclear power here once and for all. ○This action is a non-violent action. Please only participate upon understanding of this policy. Help us to spread the word to as many people as possible. We are also looking for places to place the fliers such as shops. 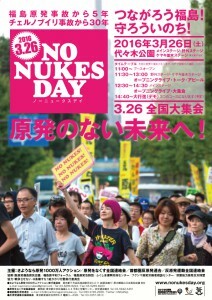 NO NUKES DAY on March 26 is run solely on donations from ordinary citizens. Please help us to continue our work with a donation. *Please put “3.26 kanpa” in the reference section.